Girded on one end by Massachusetts Avenue, on the other by Harvard Street, and traversed at its western length by a publicly accessible foot path, the property surrounding the home of the congregation of the Old Cambridge Baptist Church and the José Mateo Ballet Theatre is anything but secret or hidden. The present gardens, designed in consultation with Boston-based landscape designer Ann Uppington, comprise 17 planting beds, all maintained through organic land practices. A rainwater recovery system harvests rain off of the roof, to prevent flooding in the building; it also is the source of water for irrigation of the gardens. Foundation plantings of flowering, deciduous and evergreen trees and shrubs, as well as numerous perennials and some annuals, provide natural interest and botanical variety throughout the year. The plantings attract several species of birds, as well as bees, butterflies, and other insects. A wide range of flowering perennials affords visual delight and supplies fresh flowers from early spring to late fall for bouquets for church services, ballet programs and gifts to shut-ins. A not-so-welcome feature of nature is the invasion of a community of rabbits who destroy the tender shoots of all manner of plants, as well as help keep the grass short. Landscaping and maintenance of the gardens, initially the combined labor of love of Scott Fraser, Managing Director of the José Mateo Ballet Theater, and Grace Peters, a volunteer from OCBC, continues under the direction of Grace, with the dedicated help of OCBC member Sue Schroen and other volunteers. These gardens are intended for the enjoyment and spiritual nourishment of all who use the building, and those who live, work, visit or pass through the adjoining neighborhoods. Three garden benches offer places for guests to meet, sit, visit, meditate, and enjoy the well-tended natural surroundings. Volunteer gardeners are welcomed. No previous experience required. Tools and gloves provided. What led to the founding of the church? We were a “daughter church” of the First Baptist Church in the Central Square area of Cambridge, founded in 1817. It had become too crowded, and it was voted that the new church should request what was then called “dismission“ from the First Church in 1844. Some members of the new church felt that as Baptists they didn’t have as much status as did the established Unitarian, Episcopalian, and Congregational churches in Harvard Square (Old Cambridge, the oldest and most affluent section of the city), and that by naming the church as Old Cambridge Baptist Church, they would declare they had arrived in that area of town. Who are the people that stand out in the story of your church? In its first hundred years alone, OCBC had called 10 pastors. In the interest of brevity, those mentioned here have served from 1935 onward. The Rev. Sam Miller, 1935-1958 – Themes: Worship as the essence of church, importance of the arts (drama, poetry, etchings), transcendent reality of God in everyday life, social justice, service to students, the elderly, and service members. A “poet of prayer” and an intellectual, he later became Dean of Harvard Divinity School. Two of his sons were killed in WWII. Congregation grew to 300. The Rev. Ernst “Ernie” Klein, 1959-1974 – More liberal than some members, his theology was based on spiritual accountability via social justice actions. Lay ministry was encouraged. When the “question authority” youth movements surfaced, OCBC was ready to change with the times. An early performance of Godspell, ministries to street people, more diverse and progressive services, the formation of Common Place in 1973 (an alternative intentional living community made up mostly of OCBC members and which continues to this day), a commitment to women’s leadership and gender neutral language called for by a women’s group called Sojourners, civil rights actions, and antiwar activities were front and center. Ernie also encouraged the arts, and was himself a talented visual artist of woodcuts, drawings, and stained glass. 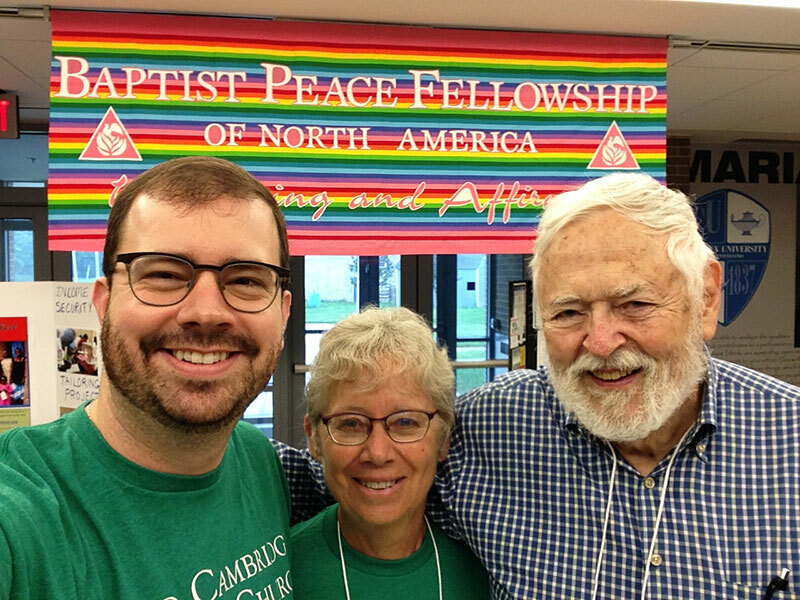 Doug Koch, a still active member, came at this time and held titles including Associate Pastor, Minister in Christian Education and Celebration, and Liturgical Artist in Residence. Many of the older members left because of the use of the sanctuary to shield anti-war demonstrators and membership was about 150. The Rev. Linda Brebner - Called as a part time Pastor, Linda shepherded the church after Ernie Klein became ill. It was a time of “Working in the Wilderness” and a “Time of Healing,” with much soul-searching on some questions raised during Klein years, similar in processes to a Transition Team. She was a strong preacher with an interest in social justice as well. The Rev. Monica Styron – An ecumenical leader and spokesperson for many social justice issues like shelter and food for homeless people, she had a gift for the personal dimensions of healing, even while “fighting the good fight.” She attracted many young people and was a dynamic presence. Her coming out as a lesbian and the church’s 1983 declaration that it was “Welcoming and Affirming” were brave acts at the time. So was OCBC’s leadership in becoming a Sanctuary church for a then-undocumented trade union activist from El Salvador (“Estela”) and its historical biblical interpretation of sanctuary, calling it an allegiance to a higher law which demanded protection for the oppressed. The Rev. Meg Hess, 1988-1990 - Not formally called as an “intentional interim” pastor, Meg helped the church to work around feelings about recent congregational controversies. The Rev. C. Irving Cummings, 1990-2011 – A progressive Christian in the prophetic tradition, his sermons often referenced “empire” then and now, in terms of allegiance to a higher authority than Rome or the current U.S. government. Also committed to social justice, especially gay rights, environmental justice, antiwar actions such as participation in Veterans for Peace, the arts, and an embrace of all faiths (including Muslim) as allies, his worship services and other activities displayed a creative and sometimes playful approach. But his sermons were deeply historical and intellectual. An out gay man (and former Presbyterian, as were Monica Styron and Linda Brebner), he was a founding member of AWAB in 1993, supported the gay marriage equality campaign. During this period, Sunday School teachers were paid, as was a much loved and capable and long term building administrator, Javier Negron, who came in 2004, along with and his staff, Angel Tirado and Victor Morales. Volunteer pastors, Jean Chapman and Nancy Willbanks ministered to homeless people and to youth and families, respectively. A new choir director (now Minister of Music), Thomas Jones, built on the work of former director/organist Arthur Hoch, and inspired the choir to new levels of professionalism. A forty-year lease with a new renter, the renowned Jose Mateo Ballet Theatre, helped keep church functioning. The $220,000/year rent led to a spate of building renovations and a firm financial footing, along with an administrative challenge on how to share the building’s main spaces. The church also took on a commitment to environmental justice and sponsored an extended family of refugees from Cameroon. The Rev. 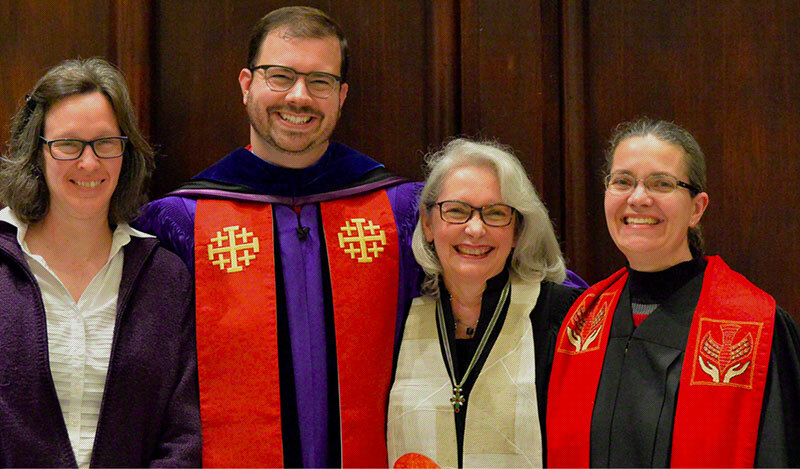 Meg Hess, 2011-2013 – Hired as an Intentional Interim Pastor this time around, she brought her training as a Pastoral Psychotherapist to assist the congregation in reflecting on its history, dynamics, priorities, ways of functioning, mission, and identity. She has served tirelessly with both the Transition Team and the Pastoral Search Team (along with Moderator Nancy Moorehead). Her caring counseling one-on-one, her administrative juggling, and her story-telling talents as a preacher, have been crucial in leading and comforting the congregation at this time of change after twenty years with our previous pastor. She also shared her skills as a labyrinth facilitator who has offered her labyrinth walks as a spiritual practice of walking meditation and healing reflection. The laity took part in many vital functions of the church as well. Many members and friends were active in social change projects such as Sanctuary for Central American immigrants, immigrants’ rights, service to the homeless, veterans, and college age youth, refugee resettlement. Church members and friends have contributed to feminist worship services and inclusive language, missionary activity, pastoral and musical service, church historians, and more. A few stand out. The Derry family - Brothers Arthur, Cecil, and Malcolm, along with their sister Evelyn and Malcolm’s wife Peg, undertook untold labors for good at OCBC. Rev. Sam Miller once referred to the Derrys as the “Derry combine.” The Derrys’ mother was raised in the First Baptist Church of Central Square (OCBC’s “mother”), and although she found it hard to leave the old church, about 1894 she moved to OCBC. Either Arthur or Cecil served as church clerk from 1942 – 1957, and Malcolm became treasurer in 1945, until 1957, when Arthur became treasurer. Arthur retained this position until his tragic death in a car accident, along with his wife, in 1965. Cecil wrote a history of the church from 1844-1944, with special mention of the work of the church’s women. He was a much loved, charismatic speaker and a revered Latin and Greek teacher at Cambridge Latin High School. Pauline Swift – A member for well over fifty years, she led Task Force on Civil Rights, which spent a great deal of time studying, collecting files, writing letters, and engaging in direct action. She was thoughtful and prayerful, but then she took action, on numerous picket lines and in many demonstrations, some resulting in her arrest. Her name lives on in an annual Pauline Swift Award given to a member of the community who has shown equal dedication to peace and justice. She is known for meeting police at the door during a 1970 antiwar riot in Harvard Square, barring them from entry and declaring the building a sanctuary for wounded protestors. Martha Jane Hackett – A very longtime member who recently left us, at least on the physical plane, Martha Jane had been Moderator, Almoner, a leader on the Finance Team, TABCOM representative and board member, and midwife in more ways than one. She delivered babies in the Chinese community and the congregation, and touched many individuals with personal “snail mail” notes offering prayers and comfort. The daughter of Baptist Missionaries in Burma, she made frequent (and dangerous) trips there and supported an orphanage, her lifelong dream. Thomas Jones – Our Minister of Music has overseen the music program at OCBC since the fall of 2002. Along with organist/pianist Kathy Maskell, he has turned an all-volunteer choir into a professional sounding group. An internationally known baritone singer for over three decades and an adjunct vocal instructor at Harvard University for 24 years, he brings considerable musical and pedagogical skills to his work as a choir director. For members of the choir, it is his patience, his caring prayers for each person, and his passion for excellence in music that has made the choir a place of privilege. Even so, an oft-heard phrase is “It’s a worship service, not just a performance.” He produces annual special services Christmas Eve (with a chamber orchestra) and Easter (with a brass ensemble) and organized a choir CD entitled “Total Praise.” He has also led the choir on three choir- related trips: New York City, Turkey and Greece, and Italy. Jim Wallace (anti war, racial justice, immigrants’ rights, housing equity) and Julia Wallace (all of those issues plus befriending homeless and undocumented and transgender individuals, dangerous trips to El Salvador to contact families of immigrant friends, a fierce “green” consciousness) contributed to the church for decades. Jim (widowed and now married to former member Renee Seale) and daughter Ginny Wallace Greene, who has been active in pastoral care and special outreach to our current families from the Cameroon, still carry on the Wallace family’s spirit and legacy. Notable guest preachers and speakers have included Phillips Brooks, Paul Tillich, David Tracy, and Harvey Cox, who is also a notable member of the congregation. In one our more colorful stories, Yoko Ono, accompanied by a silent John Lennon, sang at OCBC in 1973 while attending a women’s conference. What were some of the significant turning points in the life of the church? In recent years, there have been three major points of (ongoing) change: social justice actions, arts expansion, especially music, and the restoration, expansion, maintenance, and stewardship of the building.